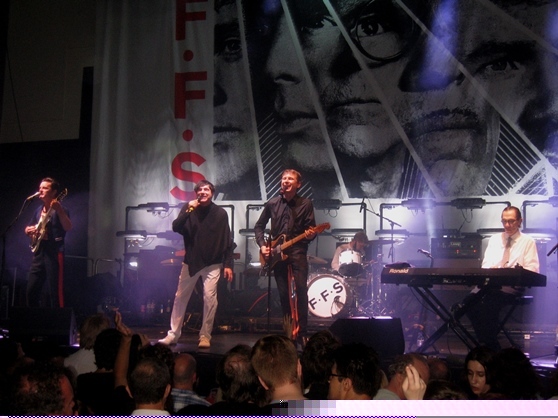 To say that FFS’ performance at The Troxy in London was a blinder would be an understatement. 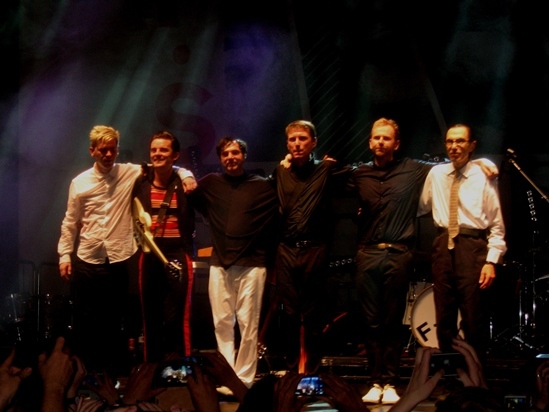 On the one hand, there was FRANZ FERDINAND, the Glasgow based art rockers, playing together with an impeccable tightness and vitality that reminded people of the freshness they brought to a 2004 music scene that was dominated by dreary bedwetters like COLDPLAY, SNOW PATROL and KEANE. On the other were SPARKS, the veteran sibling duo comprising of Russell and Ron Mael who, with a career spanning over 45 years, have had many career ups and downs including being teenybopper pin-ups and disco champions. However tonight, their trajectory is again upwards and Russell Mael in particular had the vigour of a man who was much younger than his 66 years! There is no doubt that the six piece’s self-titled collaborative album is one of the best of 2015. 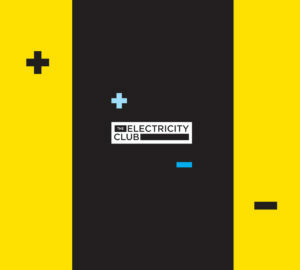 It has reinvigorated both acts and proved that age is no barrier to making great music. In the packed venue that clearly forgot to switch its air conditioning on, Russell Mael and Alex Kapranos displayed a wonderful, endearing camaraderie. Kapranos in particular was smiling and thoroughly enjoying himself, relaxed in the knowledge that the pressure of fronting the band was now shared with his falsetto ranging spiritual godfather. Meanwhile the younger Mael was relishing working with a partner who was slightly more animated than his motionless brother. But the senior Mael did have his lively moments too. Although maintaining his usual stern persona behind his keyboard throughout most of the show (save the amusing odd towel wipe of his armpits), for the powerful percussive climax of ‘The Number One Song In Heaven’, he loosened his tie, took centre stage and tap danced to huge roars of approval. Nicely segued into a synth boosted reboot of ‘Michael’, this song pairing provided a wonderful mid-show highlight. Opening with the self-explanatory ‘Johnny Delusional’, the well-paced set was drawn largely from the ‘FFS’ long player. But there were a number of favourites from the SPARKS and FRANZ FERDINAND back catalogues too. While ‘This Town Ain’t Big Enough For Both Of Us’ and ‘Do You Want To?’ were the staple crowd pleasers, there was also the welcome additions of ‘Achoo’ (the SPARKS song which FRANZ FERDINAND attempted at their first ever rehearsal) and ‘Walk Away’, while ‘Take Me Out’ predictably had the whole crowd bouncing. Nick McCarthy took to the mike for his deadpan turn on ‘The Things I Won’t Get’, but rumour has it that Kapranos already owns most of the items on the FRANZ FERDINAND guitarist’s shopping list, hence the absence of his vocal! 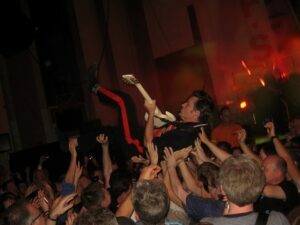 McCarthy even indulged in a spot of crowd surfing later on during proceedings. 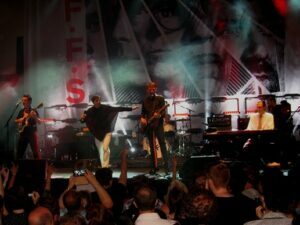 The eccentric march of ‘The Power Couple’ had the audience swinging in all manner of loopy motions, but it was the FFS album’s rousing closing track that stole the show. As the chant of “P*SS OFF!” rang in unison around The Troxy, the crowd punched the air in a gesture of defiant solidarity. Despite the inclusion of a fair number of hits, it was the positive reception for the FFS material that was the show’s biggest revelation and the key indicator of the album’s quality. ‘Police Encounters’ showed how FFS are a sum greater than its parts, while ‘Collaborations Don’t Work’ was a marvellous example of quirky songwriting that came over like seven song snippets cut ‘n’ pasted together for one enjoyable art school musical. They returned to encore with a funky rendition of ‘When Do I Get To Sing My Way’. Seamlessy welded to the catchy ‘Call Girl’, it concluded an unforgettably fabulous evening that left the multi-generational audience sweaty but grinning as they headed home.